All transactions are safe and secure with a reliable history in online purchasing behind each of our associates. Buy the Sheldon's Batman TV Show Logo t-shirt to own Batman clothing and merchandise. 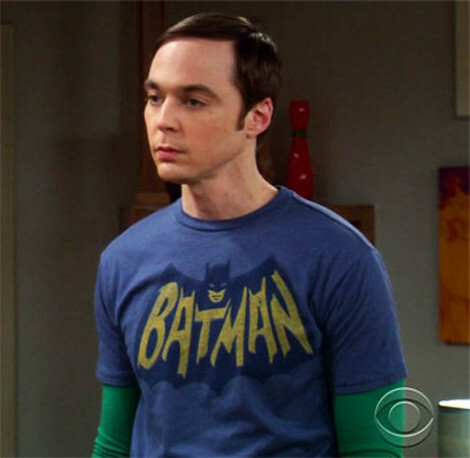 Proudly display the retro bat shaped Batman logo that is printed across the chest of this shirt that Sheldon Cooper wears on The Big Bang Theory television series. The title of the 1960s Batman show appears in yellow text inside of a dark blue bat symbol. Get this Batman merchandise item with an officially licensed piece of Dark Knight clothing. Wear it under a Batman track jacket or a comfy Batman sweatshirt. Celebrate the dark heroism of your favorite caped crusader. In addition to the Sheldon's Batman TV Show Logo tee above, browse the Batman Clothing Gallery for more apparel like men's and women's clothes, kids shirts or hoodies.